I’ve been writing quite a bit about start-ups, book-launches – by friends, alumni and people I happen to know. I am thrilled to introduce to you – Fiddler’s Green – a health food chain which just started out it’s first outlet at the MGF Metropolitan Mall in Gurgaon. 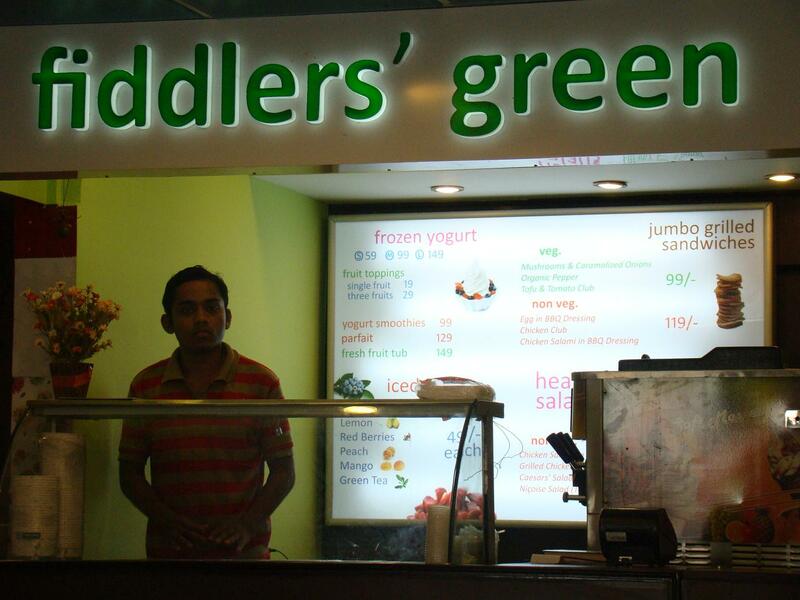 Started by 2 friends – both alumni from the Class of 2007 at IIM Lucknow – Atul Pall and Mohit Sood – Fiddler’s green will thrill you, particularly with their range of frozen yoghurt topped by the wide variety of fruits. In addition to yoghurt, they also make healthy grilled sandwiches and salads (trying to enter into Subway territory? ), bt the yoghurt there rules the roost as far as I am concerned – I have been to their store around 4 times in the last couple of weeks. Parimarily, because I like the yoghurt – my personal favourite being the “Blueberry” flavour topped with fresh mango and Kiwi! Previous Previous post: So, what does Gurgaon mean to me?